Egyptian art was produced collectively in assembly line form. Several people worked at the same time on one statue. One worked on an arm while another worked on a leg. Even painting was done in assembly line form. When a temple or palace wall needed to be painted in mural style the Egyptians would paint one color at a time. The first group would paint the first color, and then another group would paint the next color, and so on. No one person could lay claim to one public work of art. When the Egyptians found something that they liked they did it over and over, sometimes refining it over thousands of years. Most Egyptian art was commissioned by individuals who desired it in the afterlife. In fact, much of the finest Egyptian art was placed in tombs never to be seen again. It was not uncommon for a statue to depict a thin, muscular, and more handsome version of the person. Even commoners commissioned art for the afterlife. Only the phar-aohs (kings) commissioned art to enhance a building. Before 3000 B.C., Egyptian sculptures were largely crude animal figures made from stone and clay. Then, sometime during the next few hundred years, realistic lifelike statues of humans and animals began to appear. Sculptures in the round reached their peak in the Third Dynasty (2686-2613 B.C.) Probably, the first masterpiece was the life-sized limestone statue of the Pharaoh Zoser sitting on his throne. It was carved for a Step Pyramid enclosure, and it developed a large religious following. Offerings were made through the two holes where the eyes were located. For the first time, the Egyptians saw statues as an important religious concept. Offerings left at the sight could serve the pharaohs in the after-world. Before long, tomb portrait statues were common place, especially among the upper classes. Most of the work at this time was done in easy to work with limestone. However, the life size statue of the Pharaoh Khafra, the builder of the second Giza pyramid, was made out of hard granite. By the Fifth Dynasty (2494 B.C.) metal sculptures began to appear. These were largely copper sheets that were formed and nailed to a wooden core. By the Middle Kingdom bronze, which was much easier to work with, would replace copper. 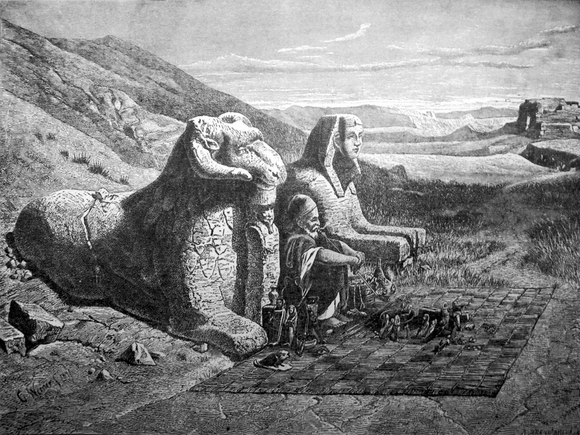 It was also at this time that the Pharaoh Khafra would carved an enormous limestone statue with his face on a lions body, in what became the colossal Sphinx. During the New Kingdom period monumental statuary reached its peak. At this time, Amenhotep III constructed two 60 foot tall 350 ton megastatues called the Colossi of Memon. However, Ramses the Great beat them all by constructing a 65 foot high, 1000-ton statue. Ancient Egyptian painting was used extensively inside tombs and temples. Archaeologists tell us that the very first crude stick drawings first appeared sometime around 7000 B.C. Some masterpieces have been discovered hidden deep inside of tombs that are as old as 3000 B.C. These painted scenes give historians amazing insight into how the ancient Egyptians lived. They tell us what they ate, drank, and how they lived. Brushes were made out of date palms that were beaten to separate the fibers. Egyptian painters worked with a surprisingly broad array of colors. However, the paint was very fragile.